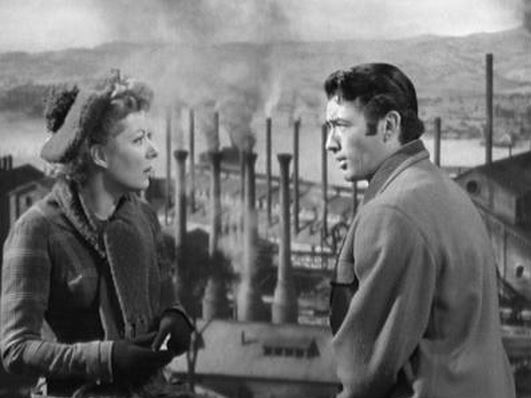 Several years ago, I was flipping through the TCM listings for films to record and came across The Valley of Decision (1945), with a star-studded cast featuring Greer Garson and Gregory Peck, and decided to give it a shot. I am so glad I did. The film opens in 1873 as Mary Rafferty (Garson), Irish immigrant and daughter of Patrick (Lionel Barrymore), goes to work as a live-in maid in the home of William Scott (Donald Crisp), the owner of the steel mill where her father was injured years before. There she quickly meets the entire Scott family: William (who is not nearly the devil incarnate that her father would like to believe); his wife, Clarissa (Gladys Cooper); their daughter Connie (Marsha Hunt); and sons Willie (Dan Duryea), Paul (Peck), and Ted (Marshall Thompson). Paul, who inherited his father’s affection for the mill and its workers, has just returned from Europe with plans to modernize so they can make the best steel in the US. Over the next year, while Paul works tirelessly on his modernization projects, Paul and Mary fall in love, and eventually Paul proposes. Mary, not thinking it proper for the housemaid to marry the son of her employers, is packing her things to return home when Connie announces that she has eloped with an English lord and they sail for England the next day. Connie asks Mary to go to England with her and Mary, seeing it as a perfect escape, agrees. She leaves without even a word to Paul, but exchanges some tense ones with her father, who never approved of her working for the Scotts. Two years pass and a strike is on at the mill, with Paul working very hard on the negotiations. Upon finding out that Paul is still in love with Mary (and hence why he is still unwed), William sends for Mary, who arrives home just as the strike is coming to a head. William gladly gives his blessing to Mary for the union, answering many of Mary’s reservations. 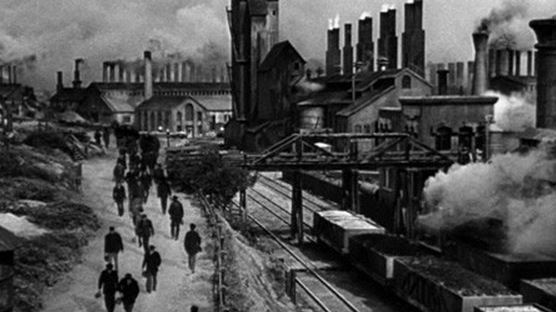 As the strike conditions worsen, Mary convinces her friend and union leader Jim (Preston Foster) to meet with Paul and William so they can end the strike peacefully, but due to a missed note to Willie, the peaceful negotiations turn violent and William, Jim, and Mary’s father Pat are killed. Overcome with grief and guilt, Mary rejects Paul again, saying that the lives lost are a sign of doom for their marriage. Years later, after Paul has married family friend Louise (Jessica Tandy), Paul and Mary are reunited through his mother, who has secretly been a partner in Mary’s dress shop. Clarissa had gone to visit Mary to tell her that she would be inheriting Clarissa’s share in the mill upon her death so that she can help protect Paul’s interest in the mill, because she knows Willie will try to sell after she is gone. And sure enough, after Clarissa’s death, Willie comes in with an offer to sell the mill for two million dollars per share and only needs three votes to do it. As he holds Ted’s proxy, he has two votes sewn up and has Connie convinced to sell as well, when Mary comes in to vote against selling. Mary convinces to Connie to keep her shares after all, and the mill is safe. Louise, who was very much in favor of selling the mill, threatens to walk out on Paul and take their son, Paulie (Dean Stockwell). Paul says she can go as she pleases and have all the money she wants, but the boy is to stay with him to be raised to love and work the mill as he does. The film closes with Paul taking Mary for a drive, off to a happy reconciliation. I love how this film takes into account some of the obstacles that Mary and Paul would have to overcome to reach a happy ending. While Paul is very much of the “if we love each other enough, we can overcome anything” type, Mary is much more practical, first rejecting him because she thinks it is improper because of class differences, and then later because she does not want to subject Paul to the curse she firmly believes her father put on them and any children they might have before he died. The only issue I have with the ending is that while I totally agree that Paul needs to be rid of Louise, I am not entirely sure that Mary, being the good Catholic that she is, would agree to marry Paul if he were divorced (based on the time period), and I definitely do not think she would agree to live with him if he was still married to Louise. Makes one wonder what the Production Code thought of that ambiguous ending, as the driving force behind it was predominately Catholic. The other thing I love is the difference in how Paul and William and the rest of the family view their place in the world. Paul and William love working in the mill and have at different points in their lives worked in the mill side-by-side with their employees to make things work better for all. They also care about their workers and are willing to make changes when the strike breaks out. This is why William was still paying Pat Rafferty and providing a house for him in the mill town after his injuries, even in an era where it was common practice to get rid of workers who could no longer work. The rest of the family–particularly Willie and Louise–believe their place is to accept the benefits (i.e. money) that the mill provides but not take any sort of hands-on interest in it. Louise in particular has an issue with associating with the workers who she feels are beneath her and her son, hence why she has a fit about Paulie spending time with Mr. Callahan (Arthur Shields) working in the mill. Another of my favorite things about this film is the great cast involved. 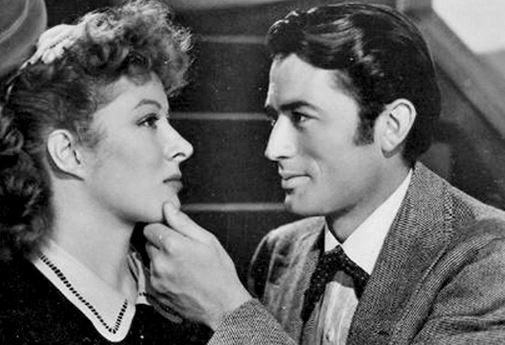 Greer Garson is a particular favorite of mine, as she is one of my favorite Elizabeth Bennets (Pride and Prejudice, 1940). By 1945, when this film came out, she had already won one Oscar and earned four other nominations before earning her fifth for her role as Mary. The supporting cast is just as strong, with Lionel Barrymore particularly fabulous as bitter, frustrated Patrick. To me, this role is in some ways a great warm-up for the one that would guarantee he is remembered forever: Mr. Henry Potter of It’s a Wonderful Life (1946). But while Potter is just a bitter miser out to rule his little corner of the world, Pat Rafferty has let his pain and frustration fester into a hate that consumes him. Among the other supporting actors, you have William Scott played by silent film star and Oscar-winning character actor Donald Crisp; Clarissa portrayed by Gladys Cooper (who would later play Rex Harrison’s mother in 1964’s My Fair Lady), and the driver McCready played by Reginald Owen (noted for countless projects including a turn as Scrooge in the much-beloved 1938 version of A Christmas Carol). Valley of Decision also features very early performances by Jessica Tandy and Dean Stockwell. Yes, film and television fans of the 80s, you read that right. Tandy, whom we all know and love as Miss Daisy (Driving Miss Daisy, 1989) and Ninny Threadgoode (Fried Green Tomatoes, 1991), started out early in her career as the scheming witch Louise Kane, while Stockwell (in his feature film debut) played her son Paulie and would grow up to play Al on Quantum Leap and later be a part of Air Force One (1997) and Battlestar Galactica. It should also be noted that Stockwell also played Kathryn Grayson’s nephew in Anchors Aweigh (1945) soon after completing his work for this film. 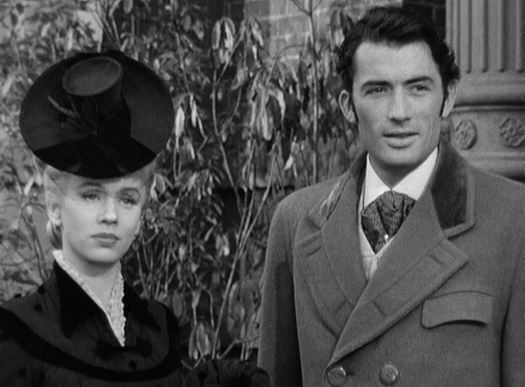 Now for the real reason that you should absolutely watch this movie: GREGORY PECK. First, a little confession: I was, at one point, one of those strange females who did not “get” the general adoration of Gregory Peck. I thought he was a terrific actor (I mean, come on, I’m not completely stupid and his Atticus Finch in 1962’s To Kill a Mockingbird is amazing), but I did not get what some of my friends saw in him that would get them to prefer him over, say, Cary Grant or a young Jimmy Stewart. That is, until I saw this movie. NOW I get it. This film was only his third, but he already possessed many of the traits that would carry him through his career–he’s handsome, poised, articulate, with an inner centered-ness that bleeds through to this and all the characters he eventually portrayed. 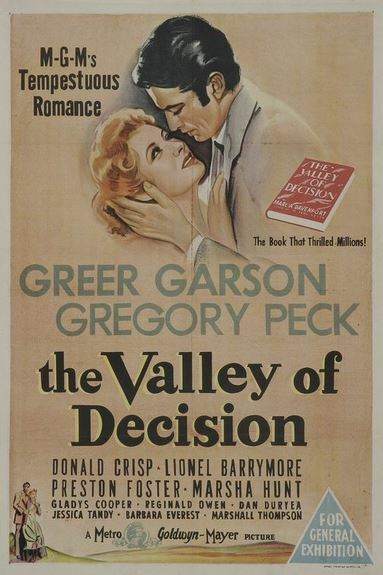 The Valley of Decision may not one of the best-known Gregory Peck films, but it is a beautiful story and definitely one worth watching. This post is an entry in the ongoing “Summer Under the Stars Blogathon” hosted by Sittin’ on a Backyard Fence and ScribeHard on Film. 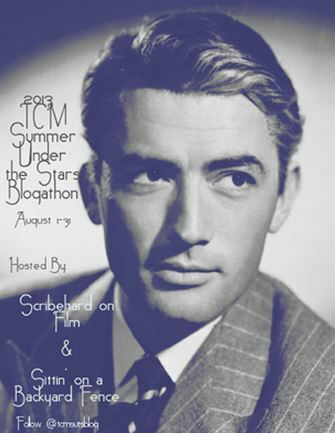 Make sure to check out the other entries that have been dedicated to the stupendous Gregory Peck today. This film always makes me cry a little. I just watched Valley of Decision on TCM. What a magnificent film. 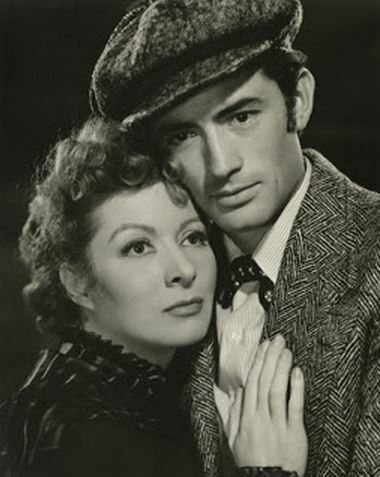 Having Greer Garson and Gregory Peck in this beautiful film describes why films of the Golden Age were so special. I never tire from watching this film. The cast, Donald Crisp, Gladys Cooper, Marcia Hunt and the other talented members were wonderful. I’m a fan of this film too. But I can rationalize the ending – if Paul and Louise were not married in the Catholic church, then according to the Catholic church it wasn’t a real marriage. Thus, he could “annul” the marriage to Louise, and marry Mary. A few years ago Gregory Peck was the Star of the Month on TCM and I caught this movie. Oh wow. Love it, love it, love it. Every single time it is on, I have to record it and watch. The supporting cast is magnificent, but it is Greer and Greg. Whoa. Two beautiful people that make this film so special. Thank you for a wonderful contribution to the blogathon. I was really hoping someone would cover this film.